Consumer airfare dropped back to a normal seasonal trendline in March after an unexpected blip in February. Prices dropped to $221 in March, 1.8% below February but 4.3% above January's level. Figure 1: Actual average domestic consumer airfare prices through March 2016 (solid line), with six-month forward forecast price levels (dashed). January offered the lowest domestic airfare we've observed in three years thanks to historically low oil prices. Prices jumped more than expected in February, but have dropped back to expected seasonal trends, averaging about 2% monthly increase since January. Jet fuel is still historically cheap at just over $1/gallon despite a further 10% recovery since February. We're projecting consumer airfare will be $227 in April, a 2.7% monthly increase. Prices will continue to climb through the spring into the busy summer travel season, with prices peaking in June at $249. That's about 9% lower than the summer peak last year. Figure 2: Recent jet fuel prices compared to consumer airfare. Airfare dipped back to normal seasonal levels despite a continued recovery in fuel prices, up 10% from February to $1.07. These are the destinations that gained (and lost) the biggest share since last month. Table 2: Domestic destinations with the biggest increase (left) and decrease (right) in share on Hopper since last month. Spring break has come and gone and travelers are looking at more northerly destinations again. 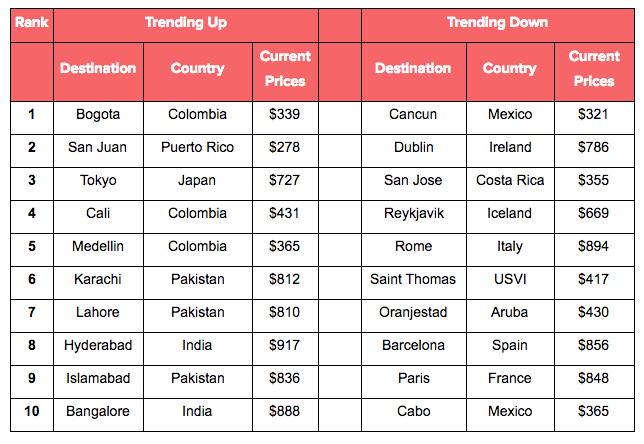 Table 3: International destinations with the biggest increase (left) and decrease (right) in share on Hopper since last month. Asia and South America are replacing Europe and the Caribbean. 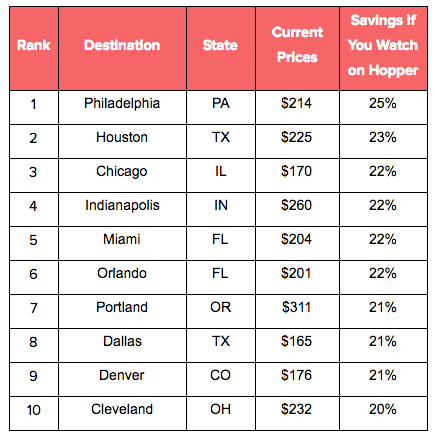 We calculated popular destinations for upcoming travel where you could save most by watching prices in Hopper. 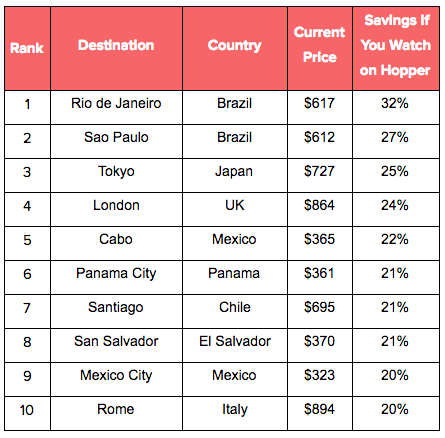 If you're interested in visiting any of these destinations in the next few months, we recommend setting your watch on Hopper now so that you can be alerted about price drops this month. To see how airfare from your state stacks up against the national average, our our interactive Consumer Airfare Index map and enter your home airport in the box. 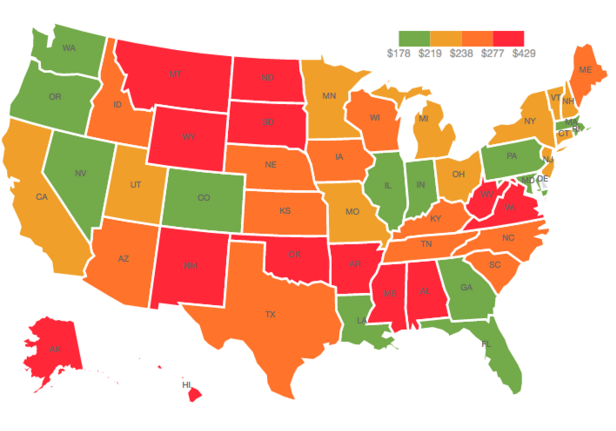 Figure 3: Average price to fly to each given state. Click on the map for the interactive version. Other indices simply take the average of all fares to represent overall price which skews the results toward expensive fares and can give an unrealistic impression of the true cost of flying. We instead use what we consider to be a "good deal" for each route to reflect what consumers should reasonably expect to pay. Second, prices change predictably with the seasons, especially during the peaks of summer and holiday travel. Of course, much of this variation has to do with increased demand - but in peak travel seasons, airlines can raise prices not only because there are more people interested in travelling, but also because the average traveler is willing to pay more for their summer vacation or trip home for the holidays. Finally, changes in prices may persist, especially if there are underlying conditions pushing prices up or down, as these effects may be spread over several months. Conversely, the opposite may be true - after a big price increase or drop, fares are more likely to change in the opposite direction in future months. Since dynamics like these and the above aren't always consistent, we evaluate future prices at the origin-destination level to capture the unique properties of pricing for different routes. Of course, predicting the future is no easy task, and many factors that influence pricing are simply unforeseeable. However, by exploiting the factors that are predictable, like trends in passenger distribution, seasonal variation, and recent price activity, it's possible to extract insights about the near future of pricing. Our index generally tracks the Bureau of Labor Statistics' Airfare Consumer Price Index, which is a related aggregation of the prices consumers pay to fly but is more strongly influenced by more expensive business-oriented travel. It's also released on a more delayed schedule than our index. 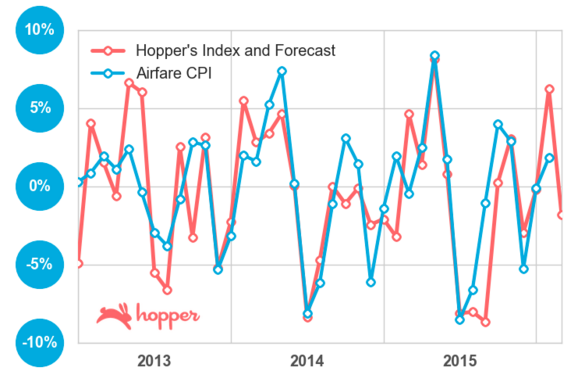 Figure 4: Comparing monthly changes measured by Hopper's consumer airfare index with the BLS airfare consumer price index. The BLS index is strongly influenced by more expensive business-oriented trips whereas Hopper's index focuses on leisure-oriented consumer travel.